I’m on a bit of a George Saunders kick. His story Victory Lap knocked the wind out of me the first time I read it a few weeks ago, and I think it may be my perfect short story. So I checked out all of his books that I could find and so far, I haven’t been disappointed. 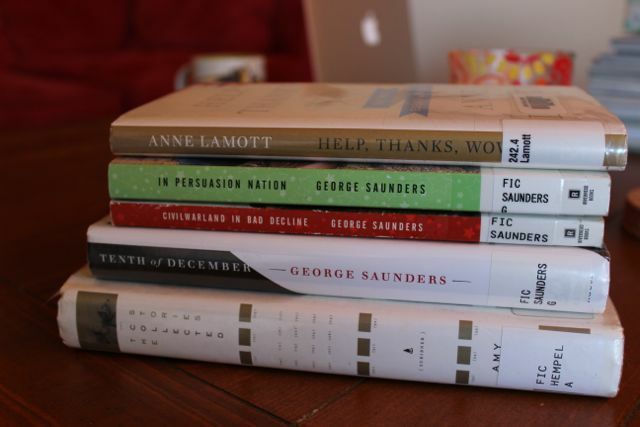 I’m alternating authors to break up the stack of George Saunders so that I don't run out of George Saunders too quickly. "Human lives are hard, even those of health and privilege, and don't make much sense. This is the message of the Book of Job: Any snappy explanation of suffering you come up with will be horseshit." And finally, I recently spent 8 weeks in a short story workshop where we read a bunch of good stories, including one by Amy Hempel that had me racked with sobs by the end. I picked up this collection of her stories because I want to know what else she has to offer. I'm hoping she's on par with George Saunders.